If this card battles with your opponent’s monster, you can return both monsters to their owner’s hands at the start of the Damage Step (without damage calculation). 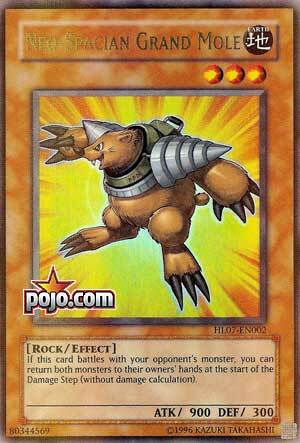 Neo Spacian Ground Mole is a Level 3 Earth Rock-type monster with 900 Atk and 300 Def. I always preferred D.D. Warrior Lady or the like to get rid of monsters without targeting during the Battle Phase. Ground Mole does this by bouncing both itself and a problematic monster that it battles back to the hand. It can be run in multiples and therefore be used multiple times per turn. There are of course much easier ways to clear an opponent’s field. Evenly Matched still works to waste a Battle Phase. You would also take much less damage because 900 Attack versus 3000 is pretty bad. Of the cards that moved around the ban list, Ground Mole just got left in the dirt. Throwback Thursday this week is a card that probably should of been at three a long time ago, for reference this was Limited back in March of 2007, when the meta was much slower, and it has stayed there for a over a decade until now. The card I am talking about is Neo-Spacian Grand Mole. Grand Mole is a Level 3 EARTH Rock with 900 ATK and 300 DEF. I don’t keep high standards for stats on Level 1-3 anymore to be honest, cause they are typically pretty weak. Rock is a nice type with some solid support and EARTH is a solid attribute. When Grand Mole battles an opponent’s monster, you can return both this card and the monster it is battling to the hand at the start of the Damage Step. This was once a great way to get rid of powerful monsters. If your opponent had a big body on the board that would take investment to get back, you could of just summoned this to bounce it back to put them back to square 1 while this would still be waiting for said monster to come back to repeat the process. Now, we have Kaijus for that problem and some monsters are unaffected by card effects, so Grand Mole won’t do anything to them except get stomped out while you take significant damage after you tried to ram a 900 ATK Mole into Apoqliphort Towers. Grand Mole is ok in 2018, but the Neo-Spacian support we are set to get should help Grand Mole with relevance later this year. Art: 3.5/5 He is sorta cute, I’ll give him that. Neo Spacian Grand Mole…also made a double jump, from Limited to Unlimited. This guy was annoying upon release, you could (and did) see him in many Decks, Hero (in whatever variant or pure) or not, cause he was that annoying. Three of these guys could honestly be dangerous, but as I’ve said this week often, the move from 1 to 3 here, should have happened ages ago. It’s not a big threat, it hasn’t been for eons, could be fun as tech. But there’s more ways than ever to deal with anything, especially something as simple as this critter anymore. Rating: 3/5 Still doesn’t make it bad, bounce is annoying, and the Damage protection is fun. This card should’ve been unlimited 5 years ago. 10 years ago, Grand Mole was a threat. A player that was up on the summon advantage could just keep re-summoning mole to bounce whichever monster the opponent had and then attack directly with their other monster(s) each turn. During the Synchro/XYZ era, this card remained limited since it had the ability to return these monsters to the Extra Deck. But in the Pendulum era, this card was not good since Pendulum monsters are able to be returned to the hand (and a variety of them even benefited from it due to them being able to re-use their effects). The consistency of Mole was just not good. As the game sped up, battle-based effects became slow. Mole’s biggest weakness: it offers no utility when summoned and only offers utility if it could get an attack through. Even during the early 2010’s, there were various outs of Mole such as Dimension Prison. But it’s just a different era. Now, especially with Mirror Force at 3, Mole is not a problem at all. Yet the fact that not even Mirror Force is used a lot anymore is just an indication of how outdated many battle-based effects are.